It is not certain if the Ideal Toy and Novelty Company would’ve survived the Great Depression without the Shirley Temple doll. Ideal acquired the rights to make dolls in the young star’s image in 1934, and by 1941, the company had sold 45 million dollars worth of Shirley Temple dolls. The dolls produced by Ideal bear an uncanny likeness to Temple – from the dimpled cheeks to the thick head of blonde curls! The first Shirley Temple dolls were marketed in fall of 1934, at that time, “Stand Up and Cheer” had just come out, and Shirley was just beginning to gain popularity. Because Ideal (the ONLY company licensed to sell the Shirley Temple doll) did not know how successful the dolls would be, the first dolls, the “prototype” doll, were not marked Shirley Temple, and were only marked on the inside of the head “(C) 1934 Ideal Novelty and Toy Co.”(also might be marked just Ideal on the head), by my own observation, these dolls had chubbier cheeks than the Shirleys made later in production, probably because Shirley was so young, and chubby herself. These dolls are slightly more valuable that the later Shirley dolls. 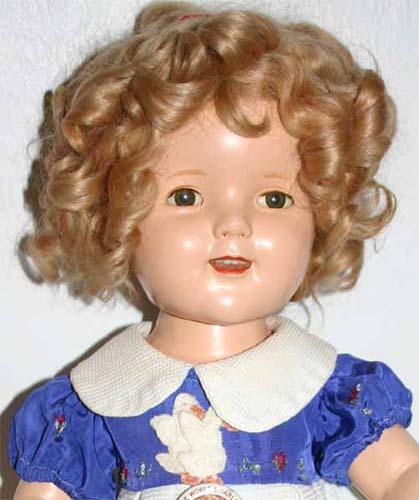 CLICK HERE to see a prototype Shirley Temple prototype doll. 4.Shirley Temple with IDEAL in a diamond below it, I have also seen just the Ideal in the diamond on the back of some Shirley dolls. The beautiful doll pictured is for sale! Click here for details! The stunning picture of the double rainbow in the gallery is from my trip to CO (just got back last night!). Wonderful time with friends!